Mindfulness is the first step in MaxxMETHOD. All change starts with awareness and these simple exercises offer the tools to become more mindful in your everyday life. Christy Maxey is a licensed psychotherapist that has been working with people for over two decades to work through challenges like loss, depression, anxiety, childhood trauma, inability to manage emotions and more. 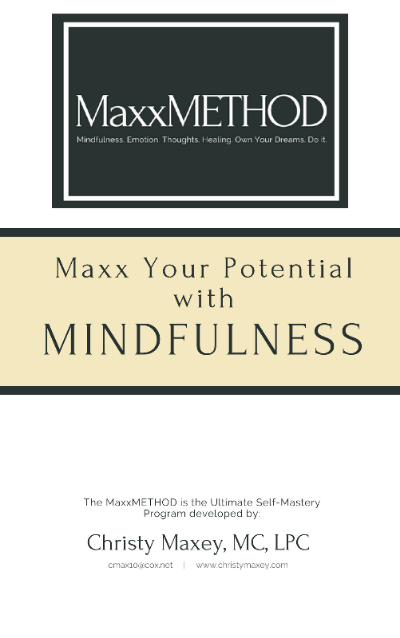 She's developed the MaxxMETHOD to address how we move through struggles and reach our maximum potential. Mindfulness is the first step. Get it here. The first step to mastering your potential is here and will be in your inbox now! Go to your inbox NOW. If you don't see me there look in promotions or spam folders and move me into your inbox! I have tools you won't want to miss!